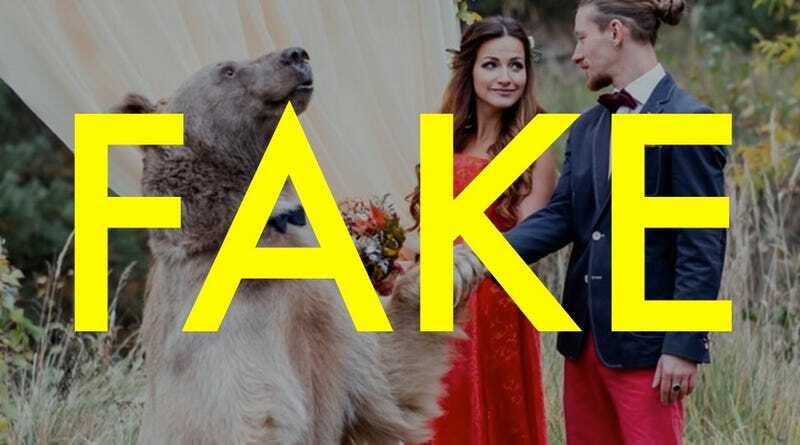 Did you see those photos of a bear officiating a wedding in Russia? Well, as cute as it was, the photo series is totally fake. As in, it’s probably not a real wedding, just a photo shoot. Buzzfeed tracked down the photographer and the people in the photo and laid out the facts. The evidence that it’s almost certainly just a photo shoot and not a real wedding? The photographer, Olga Barantseva, has done a number of staged bear photos in the past. The photographer insisted that Buzzfeed buy the photos before she would talk with Buzzfeed. And then still declined to comment. The “bride” and “groom” aren’t even connected on social media. Or at least they weren’t until Buzzfeed started asking questions. And both don’t even mention the wedding on their accounts. The owners of the tame bear, known as Stepan, wouldn’t talk with Buzzfeed. The “bride” is listed as single on her Facebook page and doesn’t live anywhere near Moscow, the city where this wedding purportedly took place. The photos fooled plenty of people though, including The Daily Mail, the New York Daily News, Yahoo News, and The Mirror, among a host of others. So it’s no wonder that Buzzfeed couldn’t get anyone to talk. It’s all quite shocking, I know. If a bear didn’t officiate a wedding in Russia we don’t know what to believe anymore.